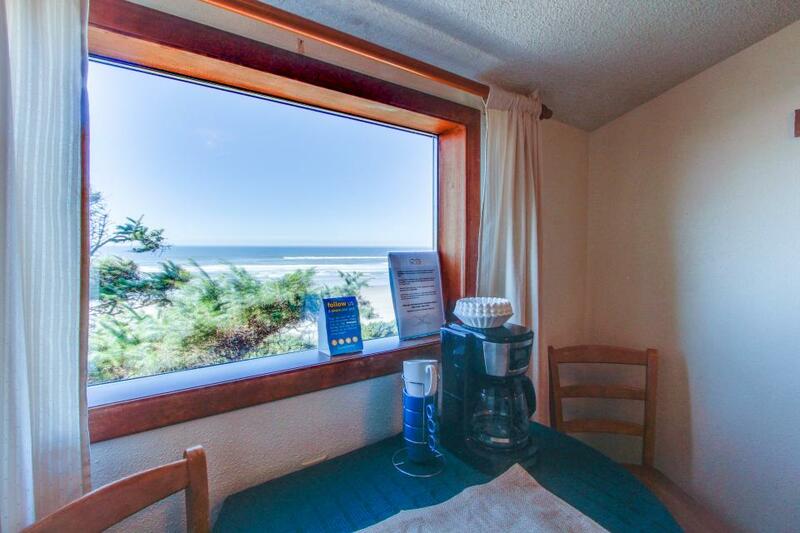 Don't forget your big sun hat, a swimsuit, and a beach towel, because when you arrive at this charming beachfront Waldport vacation rental, you'll be spending your days lounging on the sand. Just steps away from the water, this Cape Cod Cottages studio suite offers simple yet comfortable accommodations for your next vacation. Located right on Big Stump Beach, you'll have easy access to miles of unspoiled beaches. Perfect for clamming, crabbing and fishing, as well as combing for seashells and exploring the tide pools, you will enjoy a new adventure each day. You may even catch sight of a whale passing through! In addition, you'll be within walking distance to the famous Big Stump - a mysterious natural feature that is a little insight into what must have covered this area before the beaches ever existed! Head into the second floor suite where you'll find a little eating area, a mini-fridge, and a coffeemaker. Enjoy a hot cup of coffee in the morning while enjoying ocean views, or catch up on emails using the provided WiFI. This suite has two beds, a full sized bed and a queen, as well as a full bath with a walk-in shower. Altogether, this home can accommodate four guests, plus up to two pets with a $10 per night per pet fee with a $40 minimum charge per stay. Perfect for a small family, or a couple looking for a last minute romantic getaway, this Cape Cod Cottage rental offers just what you need. Make your next coastal vacation unforgettable by booking this rustic beachside retreat.